Will you be visiting the Epcot International Flower and Garden Festival this spring? If so, here’s a helpful tip for you; when making purchases at the Outdoor Kitchens rather than using cash, credit card, or MagicBand, why not use a Disney Gift Card? When I vacation during Flower & Garden in the spring or Food & Wine Festival in the fall, I always find it easier to load a Disney Gift Card and make my food and drink purchases with it. Not only does it help set a budget for my spending, it is also more convenient especially when using the mini gift cards that are designed with a wrist band. For this year’s event, Disney is offering a brand new orange-scented (think Soarin’) mini gift card with an exclusive Epcot International Flower & Garden Festival design and wrist strap. You can activate this Disney Gift Card with as little as $15 and reload it as many times as you would like. Currently the Epcot International Flower & Garden Design gift card is available at Boardwalk Inn, Beach Club, Yacht Club, Walt Disney World Swan and Dolphin as well as locations throughout Epcot while supplies last. 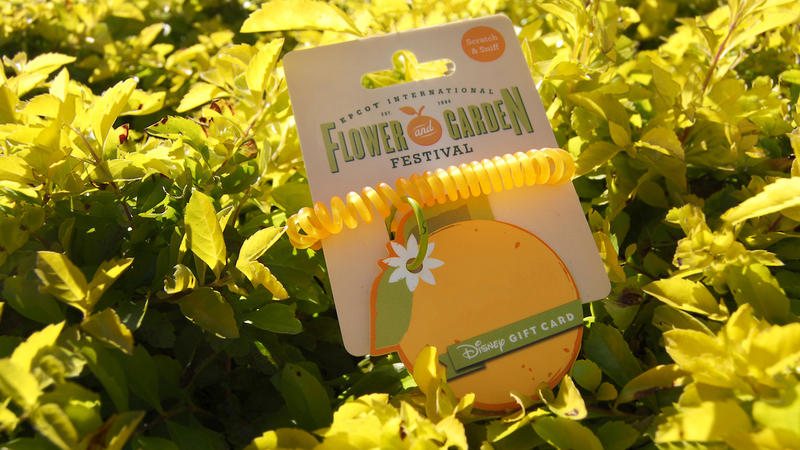 Do you use a gift card during the Epcot Flower & Garden Festival?